A long metallic container is raised from a pool of chemicals, as personnel move to revive the occupant from his cryogenic freezing. The container slides open, and inside is a dazed and confused Jack O’Neill. “It’s okay, Colonel O’Neill,” one man says. “You’re going to be fine.” The year is 2077, says the man. All of O’Neill’s team — and everyone he ever knew — is dead. There are now 28 SG teams operating from Earth, Trofsky says, plus another 10 on offworld colonies. Earth’s outpost worlds are at war with the Goa’uld, and losing. The S.G.C. needs any information Jack can provide on who might be able to help them. O’Neill recalls past encounters with other species, which are holographically displayed by the memory device. The Nox had the ability to heal people from the dead, and to make things (even their huge, floating city) invisible (“The Nox”). The Asgard protected the planet Cimmeria from the Goa’uld (“Thor’s Chariot”), and removed the Ancient’s knowledge from Jack’s brain (“The Fifth Race”). He also remembers Heliopolis — an ancient meeting place of four great races in the universe (“The Torment of Tantalus”). The Asgard would later identify these four as the Nox, the Asgard, the Furlings, and the Ancients — the builders of the Stargates. Elsewhere in the facility, General Trofsky and Dr. Raully bring another tube out of the cryogenic freezer. It is Dr. Jackson, alive and well. He, too, is told that his teammates are dead. The deception unfolds still further when Captain Carter is awoken in another room, and told the same. Carter and Jackson, implanted with the same memory devices as O’Neill, recall past events from their travels. Dr. Raully is surprised to hear Sam tell her that Apophis is dead. She tells her of his defeat in orbit of Earth (“The Serpent’s Lair”), and of his death at the S.G.C. (“Serpent’s Song”). Meanwhile, Jackson recalls the various Goa’uld with whom SG-1 has come in contact: Sokar (“Serpent’s Song”), Heru’ur (“Secrets”) and Hathor (“Hathor”). Back at the real S.G.C., the year remains 1999. Teal’c awakens with Dr. Janet Fraiser and General Hammond at his side, having been in a coma for three weeks. He recalls that SG-1 was attacked by a mixture of Horus and Serpent guards (a very unusual combination) immediately after stepping through the Stargate. He wishes to return to the planet to search out his friends, but Hammond won’t allow it. Whoever took the others is long gone by now, and the S.G.C. has already used a considerable amount of resources in the fruitless search. Teal’c refuses to give up, and will not be a part of Earth’s Stargate program without O’Neill and the others. He quits the program and returns to Chulak, where he hopes to raise an army of Jaffa against the Goa’uld. Hammond refuses to let him leave, but ultimately cannot stop him. Jack O’Neill unhooks himself from the tubes delivering sedative to his body, and remains conscious enough to overhear Trofsky and Raully speaking to one another in an obviously Goa’uld language. He senses the deception, and overpowers the orderly. Jack takes the man’s clothes and escapes. He discovers that the mock-up of the S.G.C. only goes so far. He soon arrives at a part of the base that reveals it to be Goa’uld in nature. Exploring further, Jack find Captain Carter and frees her. The two find Dr. Jackson, and evade the Horus and Serpent guards as they find the gate room. The Stargate, of course, is fake. Jackson asks who would have enough knowledge of the real S.G.C. to be able to reproduce it in such detail. His question is soon answered: Hathor appears out of no where, and SG-1 is surrounded by guards. Having escaped from Earth when SG-1 thought she was dead, Hathor has been quietly rebuilding her forces in order to move against the Goa’uld System Lords. (She has lured her guards and Jaffa from the remote outposts of her enemies.) But, having been imprisoned on Earth for the past 2,000 years, she has very little knowledge of the state of the empire. She needed SG-1’s knowledge. They, of course, refuse to tell her how to contact the Asgard, or how to get past the iris guarding Earth’s Stargate. The announcement over the intercom during O’Neill’s tour of the “future” S.G.C. instructs SG-14 to report to Level 6 for a debriefing. While SG-14 does exist in 1999 (they were said to be offworld in “Show and Tell”), the S.G.C.’s use of Level 6 would be quite new to Jack. In 1999, the S.G.C. occupies the lower levels of the Cheyenne Mountain Complex (the Gate Room appears to be on Level 28) below N.O.R.A.D. If there are unusual combinations of Goa’uld guards, then it stands to reason there may be “usual” combinations. Goa’uld may often ally with one another, so that their soldiers fight side by side. General Trofsky told Raully to keep Carter more heavily drugged, because she has naquadah in her system and would be able to sense that they are Goa’uld. Why does she have this mineral in her body? 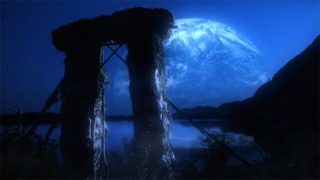 Though it has been established that Carter can sense the presence of a Goa’uld because of her joining with the Tok’ra Jolinar (“In the Line of Duty,” “Need”), and though it has been established that someone with naquadah in their system can sense Goa’uld (Cassandra in “In the Line of Duty”), it has not been established that Carter has naquadah in her body. It stands to reason that this is some strange result of being joined with a symbiote. The Goa’uld rely on naquadah for all of their technology; the mineral may also be part of their own chemical makeup. Before Hathor appears, Daniel begins to speculate that Apophis may be alive, since he is the only other Goa’uld with first-hand knowledge of the S.G.C. Indeed, this is something that Martouf warned them of when they delivered Apophis’s body to Sokar (“Serpent’s Song”). Hathor possesses cloaking technology — the ability to make herself invisible. This may be technologically similar to the Re’tu, an alien species that exist 180 degrees out of phase with everyone else, so that they appear invisible (“Show and Tell”). According to Raully, the memory device was acquired from the Tok’ra. It stimulates the memory center of the mind and amplifies it — like a capacitor for the brain. It then projects the memories holographically. Hathor – Hathor has been rebuilding her forces over the past year and a half, since escaping Earth through the Stargate. Hathor has attracted a small army of Jaffa from the remote outposts of her enemies, acquired a Goa’uld mothership and quite a bit of technology. Based on the detailed reproduction of the S.G.C. that she has constructed, Hathor has been planning this deception for quite some time. Teal’c – Teal’c has resigned from the S.G.C. and returned to Chulak. Without O’Neill and the others (for whom he left Apophis in the first place), he is unwilling to fight alongside the Tau’ri (Earth). Samantha Carter – Carter has naquadah in her system, apparently a side-effect of being joined with Jolinar of Malkshur. It is this mineral (perhaps in addition to the protein left behind by Jolinar, or perhaps instead of it) that allows her to sense the presence of a Goa’uld in someone. It may also allow her to use Goa’uld technology, as she has demonstrated in the past (“Thor’s Chariot”). Who will be implanted with the Goa’uld parasite? From which Goa’uld did Hathor steal her guards? Her ship? Her technology? Are the memory devices really Tok’ra in origin? How did Hathor acquire them? How did Hathor know exactly when and where to find SG-1 and ambush them? Is someone at the S.G.C. still under her control? VOTE! How would you rate SG-1's "Out of Mind?"